Eric Dawson and Lynda Herring possess more than 30 years of combined experience as educators, college counselors and classroom teachers, at Kent Denver School in Englewood, Colorado. Eric earned a B.A. at Guilford College and an M.A. at Miami University in Ohio. Lynda earned a B.A. at Stanford University and an M.A. and a teaching certificate at the University of Colorado, Boulder. Visit Eric Dawson and Lynda Herring in the Expert Advice section to get your questions answered. 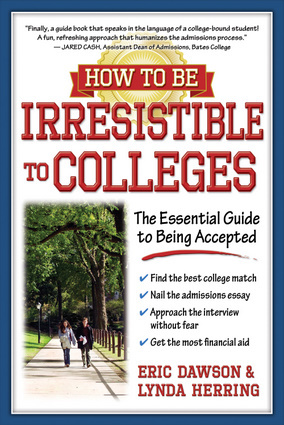 Likening the search for the perfect college to the search for the perfect mate—both are confusing, stressful, and important—this guide full of real-world examples and advice from students and college admission deans, makes the admission process clear to both students and their parents. Offering answers to the applicant's common questions—What should I expect in an interview? What should I do if I am wait-listed? How can I improve my scores?—the relatable resource explains how all the pieces work together—from "pre-date primping" (course work and standardized tests) and "the first date" (the interview and visits) to "the love letter" (personal essay), "paying for dinner" (financial aid), and "mixed messages" (the wait list). This guide goes step-by-step through the college admission process, offering honest stories, tried-and-true advice, and humorous cartoons to make this serious process more palatable, while dating tips at the end of each chapter continue the analogy and keep the tone light and fun. “This is a great book that discusses many of the confusing, conflicting, and sometimes intimidating questions associated with the search for that perfect college match. Yet the authors address those matters in a way that avoids all of the preachy arrogance that I have found in so many other books that have attempted to address the same topic. Because the authors have such a wealth of experience with so many applicants and their families, they do not need to resort to ill-informed preaching. Instead, they often support their observations and suggestions with the strong examples that only very experienced counselors can provide.